It doesn’t seem that long ago, but in 1998 Pecanwood became a part of the impressive and diverse South African golf landscape. At the time it was the Golden Bear’s second course project in the country, in an area that was certainly overdue a golfing experience to do the picturesque Hartbeespoort Dam area justice. Nicklaus was greeted by a relatively flat and uninspiring piece of land in a topography sense. The major drawcard was the dam itself, but with Pecanwood being a high-end residential estate, the best tracts on the water were mostly going to be lucrative property stands. No matter, Nicklaus threw some sand at the problem, a fair amount of it. Pecanwood has an immense number of bunkers, and with them came some brilliant slopes and mounds which added character to the design. It was an instant hit that embodied the philosophy of the greatest golfer of all time, that golf is a second-shot game. The fairways were designed to be found and though the bunkers were there, they aided in framing the target areas. Generous greens await the approach shots, with the open nature of the design meaning the course had great flexibility set-up-wise. 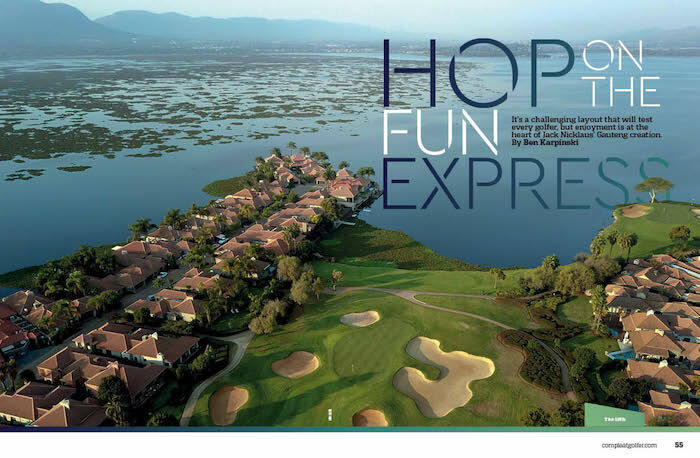 It was a resort course in the truest meaning, but being just 40 minutes from the northern suburbs of Johannesburg, it was naturally all the fun, without the lengthy trip to the coast. Now in its 20th year, the course (like most) has seen some ups and downs since its high-profile introduction. The estate’s selling piece, the Hartbeespoort Dam, has had some trying times with the invasive water hyacinth becoming more than just an unwanted eyesore covering large areas of the water. Thankfully, nothing has changed the heart of the course, though, and now with a rejuvenated staff force focused on providing something special for members and guests alike, the layout is as playable and enjoyable as ever. Upon arrival you are greeted by a modern clubhouse with all the amenities you would expect from an established housing estate. This opens up to the generous practice range that sets the tone for the day. You should never go to Pecanwood for a ‘quick’ round of golf. Once there you are in for a full day of fun and the prominence of the range reminds you of this. With over 850 homes on the course, the fear of ‘suburban corridors’ overshadowing the golfing experience is a fair concern. The brilliance of Nicklaus’ design comes to the fore again here, though, with a whole host of indigenous trees also playing their part in keeping your eyes set on the hole in front of you. The front nine winds around the ‘inland’ part of the estate, with the first few holes making a great impression on you. The par-four opening hole is a decent test right out the blocks. A slight dogleg left with fairway bunkers on either side of the fairway – a subtle introduction to the roughly 170 bunkers you will see throughout your round. Holes two and three allow you to settle into your scenic surroundings with water in play. Holes four and five provide some great scoring opportunities and views of the Magaliesberg Mountains. After strolling off the par-five 5th, the course’s teeth are revealed for the first time. The stroke-one 6th is a demanding par four that certainly requires a pinpoint tee shot. Measuring 416m from the club tees, the fairway narrows the further down you go. Approach-wise, anything too far right brings the water into play and from there you could be looking at a big number on the scorecard. This is followed by the long par-five 7th that makes you work for your par, leading to the tricky par-three 8th, which could easily see you grabbing a rake after your second shot. The hole lays claim to one of the course’s vast waste bunkers which makes the green even more sought-after than usual. The front nine comes to an enjoyable end with the par-four 9th hole, provided you avoid the cavernous bunker lurking to the left of the green. Halfway through the round, the one thing that strikes you is the conditioning of the course. The greens are pure and fairways wonderfully consistent. As for the rough, well it’s hardly too penalising; reminding you that a golf course doesn’t have to be overly difficult to be impressive. for a truly superb series of holes ahead. The par-five 12th plays directly to the water, and it is here where the wind can become a factor. of a hole that dishes up the best chance of birdie on the course. While approaching the green on 12 you can’t help but be distracted, though, by the impending beauty of the par-three 13th. Every course has its signature hole, but few make you stop and stare like Pecanwood’s main attraction. As you move from the water back into the heart of the estate, the 14th and 15th certainly don’t drop the ball in the aesthetics department. A large dam runs between the two holes, creating a watery grave for anything that goes left off the tee, but at the same time presents you with two beautiful par fours. With your scorecard hopefully still intact from there, a strong finishing stretch of three holes returns you to the clubhouse. The par-four 16th is defined by a large waste bunker complex that runs down the left side, meeting up with water to the left of the green. Like most places on the course, the alternatives to the trouble areas are obvious to make out. Though local knowledge will always be an advantage on a course, first-timers can tee it up with confidence at Pecanwood as everything is presented so well off the tee. The 17th hole is a tricky par three that returns you to the water’s edge where you look down the 18th towards the clubhouse. In general, Pecanwood offers you a fun and fair test of golf, but when it comes to the final hole, it’s all business with a par four, stroke two north of the 400m mark. If you have managed to avoid the sand throughout your round, the 18th seems like Nicklaus wanted to balance this with well-placed bunkers either side of the fairway and around the green. Par is always a good score here and with that, a terrific golf experience comes to an end. The superb conditioning, scenic location and playable layout aside, what makes Pecanwood unique is it reminds you what golf is all about – getting out there with friends, not taking the game too seriously and enjoying the process of 18 holes. From taking the time to hit some balls beforehand, to savouring the experience upstairs at the clubhouse bar, Pecanwood allows you to do it all and more. Though naturally a course that gets a great deal of member play from the local residents, the welcoming environment makes it a favourite with local visitors and corporates looking to create something special for their golf days. be a part of, and you may even run into a past South African sporting legend at the clubhouse. No matter your level of skill or enthusiasm for the game, Pecanwood is one of those essential South African golfing destinations. of future travel plans, wherever you reside in this great golfing country.